In centuries to come, slots developers will be mining the history books for new inspiration. Perhaps they'll look to the world of Greece in the early 21st Century, beset with economic woe and stuck in a 20-year recession, and base a slot on it. RecessionStruck 2, perhaps. Anyway, until then, slots developers have to content themselves with tales from an altogether different Greece, the ancient world of myths and legends. 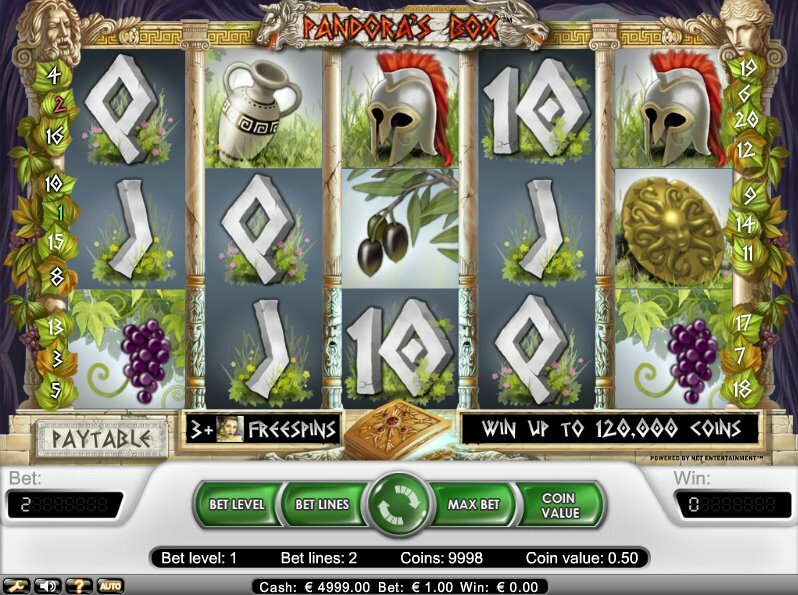 Slot developer NetEnt's Pandora's Box dips its toes into one such myth. Fans of NetEnt's own Valhalla-based god-fest, Hall of Gods, and WMS Gaming's popular Greek-themed Zeus will enjoy this game. In the classic fable, Pandora was a nosey girl who was tasked with looking after a magic box, with just one instruction: on no account should she open it. Pandora wasn't the best at sticking to instructions, however, and she duly opened the box to find out what treasures lay inside. What came out, though, were plenty of death and pestilence. Well, inside NetEnt's box isn't a huge wealth of riches, but there is a 40,000 coin jackpot to accompany this 5-reel, 20-payline online video slot to tempt the hero or heroine on their travels. 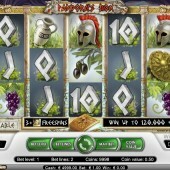 The graphics are pretty enough - all grapes, columns, wreaths and other ancient Greekness - and the pastoral music fits. Elsewhere we get some warriors' helmets, shields, jugs and lyres, plus the usual 10-through-Ace card symbols (although shouldn't they be Alpha-to-Omega symbols?). There are two Wilds, represented by a pretty pissed off looking Zeus. The normal Wild Zeus substitutes for every symbol other than the Scatter. He pays double on a win, as is standard in most slots. The Golden Zeus Wild, however, appears on Reel 3 only. Bag him in a winning combo and it pays out 4x your win. Pandora, and her flowing locks, plays as the Scatter. Get three or more Pandora symbols across the reels and you'll trigger free spins, increasing as you bag more Pandora symbols. Three scatters gets you 10 free spins plus five coins; four Scatters pays out 25 free spins plus a 25-coin win, and five Pandora Scatters gets you 30 spins plus a whopping 500 coins. On top of that, any wins during the free spins round are trebled. The story of Pandora had a happy ending, of sorts. After all the nasty stuff came out, one final nugget was released - Hope. You might not hold out much hope for the game as a whole, but with its very attractive free spins round, there's certainly something here. Perhaps with some perseverance at Pandora's Box you'll be hoping for some big wins of your own.